Accomplished immunologist Joan Cook-Mills, PhD, is the newest member of the Herman B Wells Center for Pediatric Research. Cook-Mills, who is part of the team of Pulmonary Inflammation, Asthma and Allergic Disease investigators, has spent decades working to identify genetic and environmental factors that lead to allergic disease. Learn more about Cook-Mills, including her research to determine if baby wipes contribute to the development of food allergies, in this Faculty News blog post. Have a long commute into work? Heading to the lake this Labor Day weekend? Take a moment to download and listen to the most recent episode of Healthcare Triage, a podcast hosted by IU School of Medicine faculty physician Aaron E. Carroll, MD. Carroll, who has gained a national following as a regular contributor to the Upshot at The New York Times and through his popular YouTube Channel, tackles topics related to medicine, health and health care. In the current episode, he explores whether Alzheimer’s disease can be cured in a conversation with IU School of Medicine’s Liana Apostolova, MD, the Barbara and Peer Baekgaard Professor of Alzheimer's Disease Research at IU School of Medicine. 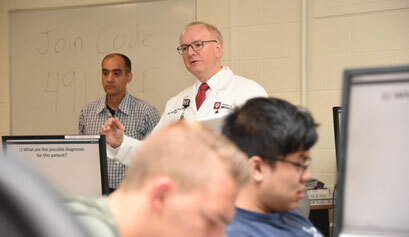 IU School of Medicine is sponsoring Healthcare Triage to help educate the public about some of the most pressing issues in health care today and to share information about research being led by IU School of Medicine physicians and scientists to develop new solutions for patients. Carroll will interview a new faculty expert each month, so don’t forget to subscribe to ensure you have access to the most recent episodes as they are available for free. This summer, 118 Class of 2021 medical students from all nine IU School of Medicine campuses presented their research projects at the Indiana Medical Student Program for Research and Scholarship (IMPRS) poster session. One hundred and three students completed a summer research experience directly through IMPRS, which connects students with a research mentor to explore topics in translational research, clinical research, health research outcomes and community health education. These student research experiences were made possible with the help of more than 35 faculty volunteers and mentors. The remaining 15 students completed experiences with organizations such as the National Institute of Diabetes and Digestive and Kidney Diseases (NIDDK), Slemenda Scholar Program and Oxford University. Read more about the summer experience and view the list of IMPRS award winners. A new LGBTQ+ECHO (Extension for Community Healthcare Outcomes) Teleclinic is designed to help health care providers and teams better understand and improve the health of gender and sexually diverse patients in the community. Available at no cost to all medical and mental health care providers, the teleclinic begins Wednesday, Sept. 12, and continues every second and fourth Wednesday from 2:30-4 pm for one year. Using Zoom videoconferencing technology, practitioners participating in the clinic will engage in brief lectures, case-based discussion and gain mentorship from experts at the Eskenazi Transgender Health and Wellness Program, the IU Health Riley Gender Health Program, IU School of Medicine and the Richard M. Fairbanks School of Public Health. All participants will receive no-cost CME and CEUs credits from the IU School of Medicine Division for Continuing Medical Education. Registration and more information are available. Questions? Call or email Andrea Janota at 317-274-3178 or ajanota@iu.edu. Learn more about the many forces that can shape the campus climate both positively and negatively. “Responding to Learner Climate Concerns” will take place on Wednesday, September 26, from 11 am-1 pm, in the Rapp Family Conference Center at Eskenazi Hospital. After watching a performance from the University of Michigan Center for Research on Learning and Teaching Theatre Program, attendees will participate in a facilitator-led discussion on the impact of an “isolated” bias incident on targeted learners, learn how to listen to others’ stories about negative experiences and share strategies for responding to concerns. IU School of Medicine-branded PowerPoint presentation templates are available for faculty, staff and student use in the Master Document Library on MedNet. Eight templates are available in two aspect ratios--four are 4:3 and four are 16:9, and there are presentation designs for internal and external audiences. File names begin with Comm-Medicine-PPT-Ext and Comm-Medicine-PPT-Int. Questions about PPT templates, posters or other design services? Contact IU School of Medicine Visual Media team at vismedia@iu.edu. The IU School of Medicine Fall Faculty Meeting will take place from 4:30-6 pm, Tuesday, October 2 in Canal 337 at Buggs Temple. Faculty meetings are held twice a year to discuss issues of importance to the school. All faculty are invited to attend the meeting in person; for those unable to attend, the meeting will be available via live web stream and teleconference. Faculty members are invited to submit questions in advance of the meeting. The IU School of Medicine Postdoctoral Association is organizing the 2018 Postdoc Symposium on Friday, October 5, in Indianapolis. The symposium will highlight research achievements of postdoctoral scholars from IU School of Medicine, IUPUI and Indiana CTSI-partnered institutes from across the state. Registration and abstract submission for the symposium is now open with a deadline of Wednesday, September 5. This year’s symposium will feature a keynote speech by Arnold I. Caplan, PhD, professor of biology and director of the Skeletal Research Center at Case Western Reserve University. Caplan’s research focuses on development, differentiation and aging of different mesenchymal tissues and harnessing the chemical as well as functional properties of mesenchymal cells to aid tissue regeneration. 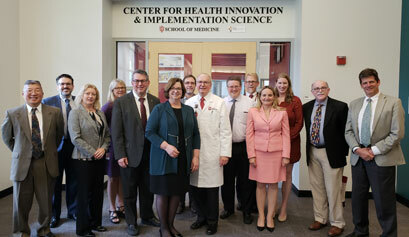 The mission of the IU School of Medicine Postdoctoral Association, founded in 2015, is to enhance the postdoctoral experience at the school, create a supportive community for colleagues, provide resources to aid in professional and personal development, and promote events tailored to the needs of postdoctoral scholars. Are you a researcher looking to further streamline your study’s design and collect more objective and multi-dimensional data from study participants? On Friday, September 14, the Indiana Clinical and Translational Sciences Institute (CTSI) will open a new RFA for funding to use a new research tool from the Indiana Biosciences Research Institute (IBRI) and MavenSphere Inc. called DigiBiomarkers. Poster submissions are now being accepted for the Indiana Clinical and Translational Sciences Institute 2018 Annual Meeting. Posters will be evaluated based on scientific content and translational impact, and winning presenters will receive a $1,000 award to support education/travel related to their research/studies. Poster registrations, including abstracts, are due by Friday, August 24. This year’s annual meeting, marking the Indiana CTSI’s 10th anniversary, will be held on Friday, September 14, in Indianapolis and will focus on the history and future of innovations in gene therapy research. Founded in 2008, the Indiana CTSI brings together the state’s brightest minds to solve Indiana’s most pressing health challenges through research. The institute is a statewide partnership among Indiana University, Purdue University, the University of Notre Dame and numerous life sciences businesses, government entities and community organizations. Do you play a wind or string instrument? Free on Sunday afternoons? Then you’re invited to join the IU School of Medicine Orchestra. The orchestra is now recruiting musicians (all instruments) for the upcoming 2018-2019 season. Founded in 2010, the orchestra serves as a creative outlet for health professions students, staff and faculty. The IU School of Medicine Orchestra performs two full symphony concerts each year and offers several opportunities for small ensemble performances. Rehearsals are on Sunday afternoons. For more information, email iusmorch@iu.edu or check out the orchestra’s group page. The inaugural Inject Tech Digital Challenge seeks your creative solutions to issues like increasing compliance to treatment, improving access to clinical trials and merging data. The challenge is a competitive process that anticipates the collision of traditionally tangential areas of research to create new disruptive solutions designed to improve patient outcomes. Applicants must have a connection to Indiana. Top entries will be on display at the Indiana Life Sciences Summit on October 9-10, and the winner will be announced Wednesday, October 10. Entry deadline is Tuesday, September 4. The IU Health Physicians Social (formerly All-Provider Networking Event) is Monday, September 24, from 5:30-7:30 pm, at The Ritz Charles in Carmel. Physicians, advanced practice providers and IU Health system executives are invited to attend. Email Betsy Gross at bgross1@iuhealth.org or call 317-833-0767. Complimentary parking is available. Busy campus…busy streets. With the semester just beginning and two-way traffic on Michigan Street a reality, students, faculty and staff are reminded to stay safe and aware when driving, walking and bicycling on campus. Continuing the efforts started last year to improve safe usage of streets, IUPUI has launched a pedestrian/cyclist safety and driver education campaign. Look for “Busy campus…busy streets” signage on gerbil tubes, garage gates and even coffee sleeves. A new website offers safety resources.